Just about any knitter who’s ogled a cable knows about Norah Gaughan. Elements of familiar cable shapes and silhouettes emerge from the chrysalis of her mind as inspired new garments and accessories. A beautiful example of Norah’s unique design aesthetic and unconventional way with cables is the Sloan Dress from Wool Studio Vol. IV. The cables are perfect: they don’t overwhelm the dress but rather add a bit of knitterly intrigue and delicate sophistication. The turtleneck adds great balance to the cables, while the short sleeves keep this piece effortlessly wearable. And if a knitted dress is just outside of your comfort zone, you can shorten it to a tunic. My favorite part about Norah’s cables is that I can see them on so many different things—I like to think of her patterns as “reusable” in that sense. This cable pattern, for example, would make a stunning pillow or a really cool cowl! 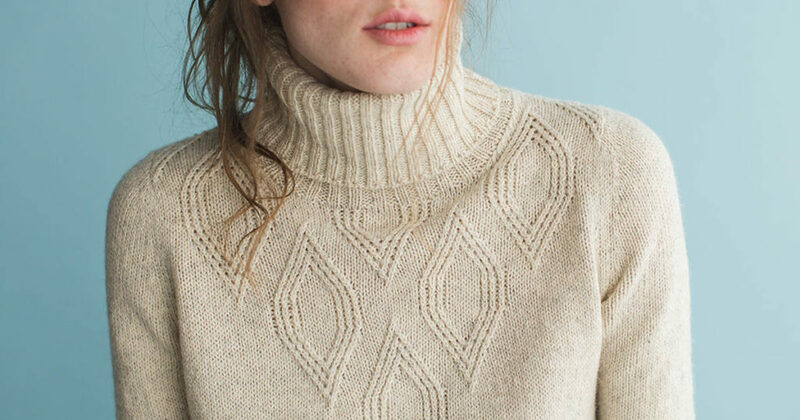 If you love knitted cables, I highly suggest checking out the rest of Norah’s Wool Studio collection, which is full of patterns in which familiar design elements are turned into striking projects, as well as her book of creative cables. And for the first time, you can order a beautifully bound book version of this collection. Grab one today at your local yarn shop or in our store. For those seeking more knitting luxuries, check out these products.